Mega-sporting events focus attention on human rights, however, it is often for a fleeting moment. It requires a great sense of urgency if improvements are to take place. In construction, it means a big, but temporary surge in activity for stadiums, hotels and related facilities. Mega-sporting events focus attention on human rights, however, it is often for a fleeting moment. The international trade union movement has long been active on sporting events. In this area, Building and Wood Workers’ International (BWI) is one of the most focused and persistent Global Union Federations. They have engaged and tried to work with FIFA, including by making a submission under the OECD Guidelines for Multinational Enterprises, to encourage them to cooperate. They have also intervened with the International Olympic Committee and are actively participating in the ongoing IHRB facilitated multi-stakeholder effort to ensure respect for human rights across all stages of mega-sport event life cycles. Trade unions appreciate Professor John Ruggie’s report to FIFA in large part because he suggested putting in place systems to ensure that human rights risks are dealt with systematically, in particular, with respect to due diligence, rather than on an ad hoc, emergency basis driven by catastrophic headlines. Real change is not parachuted in, but built on the ground. Trade unions know positive change is most likely to be produced when activity is sensible, practical and organised. BWI has worked on Qatar with international bodies, in particular the ILO, with global construction companies, especially with those that are signatories of global agreements, and with other businesses and civil society organisations, including by participating in the mega-sporting work of IHRB. But, most importantly, they have engaged directly with the Qatar authorities. One concrete result of those discussions is a recently signed memorandum of understanding (MoU) between BWI and the Supreme Committee for Delivery and Legacy in Qatar. The Committee is charged with World Cup-related construction for 2022. This agreement is for one year, but can be renewed based on a joint review of its effectiveness. Inspections and related procedures are covered for worker accommodations as well as worksites. A few months before this agreement, BWI, their Russian member organisation, FIFA, Russian authorities and others signed an MoU for the 2018 Games in Russia. Trade unions have learned that workplaces are much safer if workers are involved in their own protection. Under the Qatar agreement, BWI will also conduct health and safety training for the Supreme Committee and its contractors. It will “review and assess the SC’s current Workers’ Welfare Forums - a mechanism developed to allow workers to express and resolve their grievances and other issues…” Trade unions have learned that workplaces are much safer if workers are involved in their own protection. 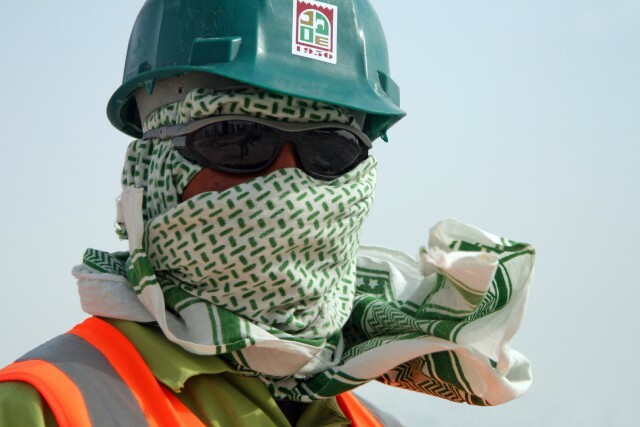 There are millions of migrant construction workers who have worked in Qatar, are working there now or will be in the future. Although the Supreme Committee/BWI MoU is only for facilities being built for the 2022 World Cup, BWI is interested in extending the relationship with the Qatar authorities to all construction activities. That industry is a vital component of the long-term development plans of Qatar. For many years after the last football fan leaves the stadium, it is important to continue to work inside the country to protect the rights and conditions of workers. Although the Supreme Committee/BWI MoU is only for facilities being built for the 2022 World Cup, BWI is interested in extending the relationship with the Qatar authorities to all construction activities. There are many human rights challenges in Qatar. Some may consider that trade unions should wait until more progress is made before engaging and cooperating with the authorities. But being aloof from the current problems of workers has never been a trade union luxury. It is neither in keeping with our habits nor in conformity with our mission and mandate. It is necessary to work in nearly every country where worker rights are not fully respected. This includes countries with good legislation, but where precarious work or other factors rob workers of the effective exercise of their human rights. In Qatar, in spite of all of the problems, BWI has achieved global union recognition, access, and serious cooperation commitments. In some countries, the human rights picture is totally bleak. In some places, even the right to complain, much less struggle, is denied. In Qatar, in spite of all of the problems, BWI has achieved global union recognition, access, and serious cooperation commitments. This should make it possible to make a difference on occupational health and safety and accommodations in the country. For the future, it should enable BWI to further contribute to improved respect for other human rights.